But however you encountered the “crime does not pay” formulation, you’ve doubtless heard it and internalized it. Of course it’s true. Crime doesn’t pay and the good guys always win in the end. Right? Well, let’s examine this old adage for a moment. Why is it necessary to point out the poor remuneration of crime in the first place? We generally don’t go around pointing out things that are self-evidently true or just plain common sense, so there must be some reason people need to be reminded that crime is not a profitable endeavor. And that reason can only be that many people believe it to be a rewarding profession, financially or otherwise. So why would they think that? Sadly, one does not look very far to understand why people need to be constantly told that “crime does not pay.” And that is because crime does, in fact, pay. Quite handsomely, even. . . . if you’re in government. Now there are many reprehensible incidents from McCain’s ignominious career that were studiously ignored in the torrent of retch-inducing encomia that accompanied his passing, but for our purposes today one scandal in particular stands out. Back in the 1980s a scandal erupted around Charles H. Keating, Jr., Chairman of the Lincoln Savings and Loan Association, which had come under scrutiny from government regulators for its part in the savings and loan crisis. Keating had responded to the unwelcome attention of government regulators by doing what any other businessman in his situation would do: attempt to buy off the regulators. (After all, this is precisely what the government regulation trap has been designed for.) And so he spent $1.3 million lining the pockets of five US Senators (the “Keating Five”) to help him get the regulators off his back. They all happily accepted his money and—wouldn’t you know?—the regulators did back off their investigation of Lincoln. The plot finally blew up after two years of sporadic coverage in the press and it kicked off a Senate Ethics Committee investigation into the actions of the five senators who had taken Keating’s bribes. Naturally (for those of you who don’t know the punchline yet), one of those senators was none other than Saint McCain himself. Of course, the Senate Ethics Committee eventually cleared McCain of wrongdoing (while chiding him for “poor judgement”), but it was widely reported at the time that McCain had improperly leaked details to the press about his fellow senators in order to throw the blame on them (and thus exonerate himself). While that’s bad enough, the real crime came when he lied about these leaks under oath. But since history is written by the winners—which today means the editors of Wikipedia—the official history of the Keating Five prominently notes McCain’s official exoneration and buries the official accusations of perjury in the second-to-last paragraph of the lengthy article. For Saint John McCain, crime most certainly did pay. But as my regular readers do not need to be told, a mere political bribery scandal doesn’t even scratch the surface of government criminality. There is no end to the litany of counter-examples that we could cite to The Shadow’s famous dictum about the profitability of crime. We could talk about the CIA’s long involvement in drug running, attested to by no less a personage than Skull & Bones John Kerry (who, as a Bonesman, certainly knows a thing or two about illegal drug running). We could talk about the Iran-Contra scandal, which connected the CIA’s illegal drug running to the illegal deep state program to sell arms to Iran to the still under-discussed plans for a martial law takeover of the US. We could talk about Iran-Contra criminal John Poindexter, who went on to spearhead DARPA’s illegal Information Awareness Office (aka the all-seeing-eye-irradiating-the-globe quest to collect all data on everyone everywhere) which – as I’ve reported in these pages – was never really scrapped, only restarted under a different guise and with more government secrecy. Indeed, we could talk until we’re blue in the fact and still never even scrape the surface of all of the myriad ways that government criminals are protected in this psychopathic statist system we currently inhabit. 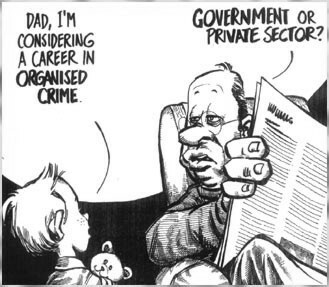 Of course, it’s not just government workers for whom crime is booming business. It’s the too-big-to-jails like HSBC and the other drug money launderers, robosigners, price fixers and all-round thugs that comprise the bankster class. It’s the fraggers and the state-sanctioned murderers of the military-industrial complex. It’s the misinformers and disinformers and outright killers in Big Pharma who are happy to prolong sickness and hasten death in the pursuit of a quick buck. This is the problem with criminality. Like a cancer, if it is allowed to fester in one part of society it will, sooner or later, spread to others. And, left unchecked, the cancer of criminality will eventually kill the host that it’s invading. Where’s The Shadow when you need him?